NASA has had to balance customization and cost in building spacesuits, and that challenge will never go away. A U.S. spacesuit on board the International Space Station. Spacesuits are intricately designed machines that have to stave off a host of potentially fatal space threats, which means it's not really the sort of attire where you want to compromise on fit. 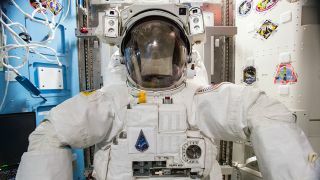 The trickiness of those suits, formally known as Extravehicular Mobility Units, made headlines last month when NASA shuffled spacewalk assignments because of suit fit issues. But managing the persnickety protective garments isn't a new problem for the space agency as it has sought to clothe a range of astronaut bodies. "Folks tend to talk about it in more simplistic terms, they talk about if you're normal or not normal," Amy Ross, a spacesuit engineer at NASA's Johnson Space Center (JSC) in Texas, told Space.com in mid-March, before any of this spring's spacewalks. But that isn't how real bodies actually work. "I've got 100th percentile dimensions and I've got 5th percentile dimensions," Ross said. "Everybody is combinations of these weird statistics about body parts. There is no normal person." Many of the challenges surrounding spacesuits, like so many challenges in life, arise from having to balance competing priorities in a world where perfection is at worst technically nearly impossible and at best prohibitively expensive. When it comes to spacesuit sizing, NASA hasn't always opted for standard-size components. "Early on, when we were first building spacesuits, our astronaut class was smaller, so we could build a custom suit for each person — we could measure you and size your suit," Jennings said. "But once we started flying space shuttle and ISS, we just had so many astronauts, we weren't going to have that many suits. So we started making it modular so we can mix and match." But mixing and matching is easier said than done, as the recent kerfuffle over spacesuit sizing shows. Right now, the International Space Station hosts four fully configured spacesuits for extravehicular activities (EVAs) — one each with a medium and an extra-large Hard Upper Torso unit, plus two with large units. In addition, there is one spare, unconfigured unit for each of those sizes on board, Rick Henfling, a spacewalk flight director for NASA, said during a news conference held yesterday (April 2). Switching out a Hard Upper Torso unit can take about 12 hours of work, so instead of rushing the job and postponing other tasks, NASA shuffled astronauts for the two remaining spacewalks. But because that canceled the first-ever and much-hyped spacewalk of all-female astronauts, the decision was met with derisive headlines, a Saturday Night Live skit and questions from Congress during NASA Administrator Jim Bridenstine's latest appearance before the House science committee yesterday (April 2). But NASA doesn't have any current plans to build new suits expressly for EVAs at the International Space Station, Kenny Todd, NASA's manager for operations and integration of the space station, said during a news conference held yesterday to discuss an upcoming spacewalk. The orbiting laboratory will host tests of future spacesuit designs, he added, but these will be destined for new types of missions. In particular, NASA's spacesuit engineers are currently focused on missions that land humans on the moon, and one day, on Mars. But right now, the U.S. doesn't fly any suits that can be used on such a mission. After all, NASA hasn't needed suits designed for walking — which must prioritize lower body movement — in nearly 50 years. NASA has flown two different kinds of suits within the past decade, and each is designed for purposes that are very different from those of a suit made for walking on a planet. Crew survival suits are unpressurized, light and flexible, designed to protect an astronaut if something goes wrong on the space station. The suits used during EVAs at the station are much more armored than survival suits, but are optimized for upper-body mobility, not lower, to facilitate moving along the space station handholds. So in addition to the other mission components facing accelerated timelines — rockets, capsules, landers and more — development of a spacesuit made for walking will also need a new schedule, Bridenstine confirmed during yesterday's hearing, in response to a question from Rep. Brian Babin, R-Texas. "In order to get to the moon's surface, we have to have new spacesuits. It's, uh. Can't —," Bridenstine said. "It's a no-brainer," Babin interjected. "Yes," Bridenstine said. NASA's spacesuit engineers can consult with predecessors from the Apollo era to avoid repeating some of that work, but they still need to develop a new suit. And although building a modern version of a suit that lets explorers walk will be a challenge, it also offers opportunities to reevaluate all of the engineering built into the garments. That could include a switch back to tailor-made suits, particularly for Mars, where an astronaut would remain for a long time and conduct numerous walks. Ross compared such a suit to the coveralls her grandfather wore as a farmer. "You need to be able to just put on your coveralls and trust them to be able to do their job for you," she said. "One method to do that is to customize them, right, to get just the right suit fit so that when you put them on, it's your overalls and you're able to go outside and do your job." NASA hasn't committed to either approach yet. Last month's challenges point to another way engineers would like to improve on current spacesuit design — by making suits that don't require so much of an astronaut's time. After all, it was the 12-hour time frame to change out torso units that made shuffling suits such an impractical option. Even without changing segment sizes, spacesuits require a lot of upkeep. Astronauts regularly check over each piece of a suit to make sure it still has its full protective capabilities. That takes countless hours of crew time — time that astronauts can't spend working on the science they were sent there to do. Lower maintenance and spacewalk preparation needs would offer astronauts more flexibility in exploring the world around their vehicle, wherever it may be. "If we can change some of the spacesuit design, then we can kind of change the way we go and do EVAs," Jennings said.